At Motor Expo 2012 among the cars on display at the BMW stand was the first public showing of the BMW M5 M Performance Edition. The BMW M5 M Performance Edition will be a limited edition run of thirty BMW F10M M5′s, each with a different matte body color. Just ten of each car will be made available, ten frozen red, ten frozen blue and ten frozen white. The frozen blue and white colors are specially developed paint works, the red is a wrap. The cars are UK-only models. Aside from the paintwork, each car gets Black Merino leather upholstery with contrasting stitching, floor mats with contrast piping, an Alcantara steering wheel, BMW Individual Piano Black interior trim with a laser cut designation, front headrests with M stitching and door sills with ‘BMW M Performance Edition’ designation. The BMW M5 M Performance Edition gets £22,075 worth of optional extra equipment. Further additions include 20 inch M Double-spoke Matt Black alloy wheels, Dark Chrome exhausts, side gills and kidney surround and M Sport multi-function seats with lumbar support. 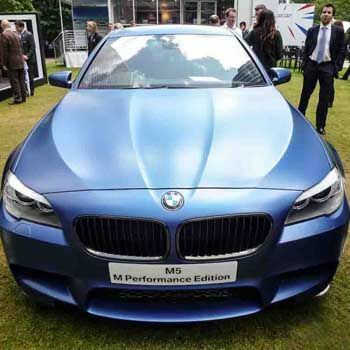 In terms of technology, the M Performance Edition also gets a reversing assist camera, High-beam assistant, Internet, BMW Professional 12 loudspeaker system, telephone USB audio interface, mobile application preparation and speed limit display. Each car will cost £95,140 and will come with three years warranty. Underneath you still get the same 2012 BMW F10M M5 meaning a high-revving 4.4 liter V8 engine with twin scroll, twin turbocharger technology and power outputs of 560hp and 680Nm of torque. At the moment, there are no plans to include the body colors in the standard BMW color options.